346 Marlborough is located on the south side of Marlborough, between Gloucester and Hereford, with 344 Marlborough to the east and 348 Marlborough to the west. 346 Marlborough was built in 1877-1878 by Keening & Fellows, masons, for real estate dealer Henry Whitwell, for speculative sale, one of five contiguous houses (338-340-342-344-346 Marlborough) they built for him in 1876-1878. He is shown as the owner on the original building permit application for 344-346 Marlborough, dated September 18, 1877, and on the final inspection, dated May 15, 1878. No architect of the houses is indicated. As originally built, all five houses were of the same design, three stories high plus a basement, with an angular (octagonal) bay on the left and the top floor enclosed by a mansard roof. 338-340-342 Marlborough were built on 22 foot wide lots and 344-346 Marlborough were built one year later on 20 foot wide lots. Between 1887 and 1897, additional stories were added at 338 Marlborough and 340 Marlborough. Henry Whitwell purchased the land for all five houses on April 1, 1872, from a real estate investment trust formed by Grenville Temple Winthrop Braman, Henry Dwight Hyde, and Frank William Andrews. The land was part of one of four tracts of land the trust had purchased on March 1, 1872, from the Boston Water Power Company. Click here for an index to the deeds for 346 Marlborough. By the 1878-1879 winter season, 346 Marlborough was the home of Edward Clarke Ellis and his wife, Lillie Harriet (Ely) Ellis. They previously had lived at 4 Spruce. Edward Ellis was a wholesale cotton merchant and later would become a real estate broker. They continued to live at 346 Marlborough during the 1882-1883 winter season, but moved thereafter to the Hotel Vendôme. On March 10, 1883, 346 Marlborough was purchased from Henry Whitwell by Mary Bartlett (Vose) Hayward, the widow of Isaac Davenport Hayward. She and her their children, Mary May Hayward and Roland Hayward, made it their home. They previously had lived in Milton. 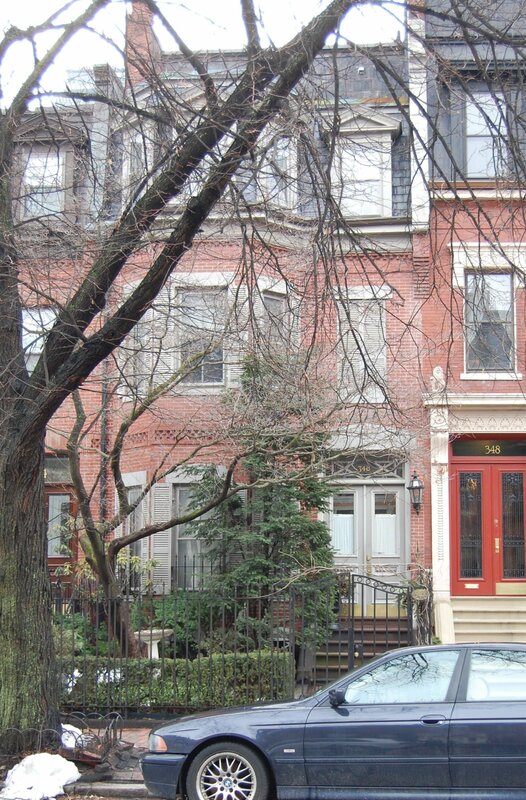 As built, the rear façade of 346 Marlborough corresponded with the houses at 338-344 Marlborough and 348-362 Marlborough. Sometime between 1890 and 1895, the rear was extended further south and a bay spanning most of the rear façade was added. Probably at the same time, a partial fourth floor was added on the half of the house. Sometime between 1895 and 1897, the rear of 344 Marlborough was extended even further than 346 Marlborough, with a wooden oriel window. Mary May Hayward married in October of 1899 to Henry Winchester Cunningham and moved to 351 Marlborough. Mary (Vose) Hayward continued to live at 346 Marlborough with her son, Roland, a stockbroker. He also maintained a home in Milton. Mary (Vose) Hayward died in September of 1901. After her death, Roland Hayward moved to 351 Marlborough to live with his brother-in-law and sister, Henry and Mary Cunningham. He also continued to maintain a home in Milton, where he died in April of 1906. 346 Marlborough was not listed in the 1903 and 1904 Blue Books. On April 29, 1904, 346 Marlborough was purchased from Mary Hayward’s estate by Mary (Brooks) DeBlois, the wife of real estate broker and trustee George Lewis DeBlois, III. They previously had lived at 18 Fairfield. They continued to live at 346 Marlborough during the 1919-1920 season, but moved thereafter to The Puritan at 390 Commonwealth. During the 1920-1921 winter season, 346 Marlborough was the home of Henry Maynard Rees and his wife, Eliza Pugsley (McKeehan) Rees. They had married in September of 1920 in Cleveland while he was a medical student. By 1922 they had returned to Cleveland, but by the 1924-1925 season were living at 110 Marlborough and he was executive of a bearings manufacturing company. During the 1921-1922 winter season, 346 Marlborough was the home of coal dealer Louis Frederic Stanton Bader and his wife, Constance (Jaques) Wadley Bader, They had married in June of 1921. Their principal residence was in Dover. On August 7, 1922, 346 Marlborough was purchased from Mary DeBlois by clothing and woolens merchant James Leonard Wesson, a widower. Living with him were his daughters, Isabel Wesson and Caroline (Wesson) Freeman, widow of Henry Huggeford Freeman, and the Freemans’ son, James W. Freeman. They previously had lived at 174 Newbury. On October 10, 1924, James Wesson transferred the property to his daughters. James Wesson died in November of 1927. Isabel Wesson and Caroline Freeman continued to live at 346 Marlborough. They also maintained a home in Sandwich. From about 1928, they were joined by Caroline Freeman’s daughter, Lucy (Freeman) Leser, the former wife of Felix Leser, and probably their son, Felix Leser, Jr. They lived at 346 Marlborough until about 1931. During the 1931-1932 and 1932-1933 winter seasons, Caroline Freeman and Isabel Wesson were living elsewhere, probably traveling abroad, and 346 Marlborough was the home of investment banker George A. Percy and his wife, Elvia W. (Enders) Percy. They had married in April of 1931 and 346 Marlborough probably was their first home together. She was an actress and had been playing a leading role in the play “Little Accident” when they met and married. By the 1933-1934 winter season, Isabel Wesson and Caroline Freeman had resumed living at 346 Marlborough. Isabel Wesson died in November of 1936, and Caroline Freeman moved to an apartment at 90 Commonwealth. 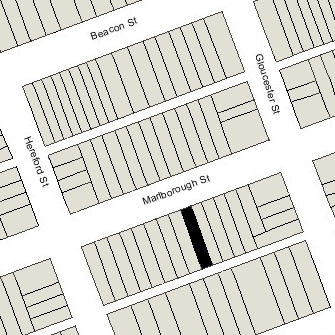 On June 29, 1937, 346 Marlborough was purchased from Caroline Freeman by Shirley Clifford Speed, a real estate dealer who converted many Back Bay houses into lodging houses and apartments. On September 1, 1937, S. Clifford Speed sold an undivided half interest in 346 Marlborough to Mabel (Clark) Shaw Welsh, the wife of real estate dealer Willard Welsh. They lived in Malden. That same month, she applied for (and subsequently received) permission to convert the property from a single-family dwelling into a lodging house. By 1939, 346 Marlborough was the home of Robert Wadleigh Goodhue and his wife, Bertha Alfreda (Duff) Goodhue, who operated it as a lodging house. He was a newspaper press operator. They previously had lived at 379 Marlborough, where they had operated a lodging house. They continued to live at 346 Marlborough in 1940, but moved thereafter to 323 Marlborough by 1941. On May 18, 1944, 346 Marlborough was acquired from S. Clifford Speed and Mabel C. Welsh by Dr. Philip Edwin Adams, a dentist. He and his wife, Ethel Marie (Sanford) Adams, made it their home. He maintained his offices at 106 Marlborough. They previously had lived in Newton and, before that (in about 1939 and 1940) in an apartment at 196 Beacon. The Adamses returned 346 Marlborough to being a single-family dwelling. Ethel Adams’s parents, George Otis Sanford and Edith Bowker (Roby) Sanford lived with them. They continued to live at 346 Marlborough until about 1953, when the Adamses moved to 170 Marlborough and the Sanfords moved elsewhere. On June 18, 1953, 246 Marlborough was acquired from Philip Adams by Kilby Page Smith, Jr. and his wife, Elizabeth (Carret) Smith. They previously had lived in Scituate. He was president of the Lincoln & Smith Press, publishers. In August of 1953, he filed for (and subsequently received) permission to remodel portions of the interior. In his application, he indicated that the current and proposed use was as a single-family dwelling. They continued to live there until about 1960. On May 31, 1960, 346 Marlborough was acquired from the Smiths by Estrella Louise (Johnson) Poling, the wife of Robert Adams Poling. He was president of Packer’s Laboratory, Inc. They continued to live there in 1962, but moved thereafter to 25 Bay State Road. On July 30, 1962, 346 Marlborough was acquired from E. Louise Poling by Richard T. Beck and his wife, Doris S. Beck. They previously had lived at 12 Chestnut. He was assistant comptroller of the American Optical Company. On January 17, 1964, 346 Marlborough was acquired from the Becks by the Southbridge Development Company (Earl T. Brown, treasurer). On September 18, 1964, 346 Marlborough was acquired from Southbridge Development by Theodore Wallace Head, an interior decorator, and Patrick P. Trani, a teacher in Watertown. They previously had lived at 19 Garden. In June of 1965, Theodore Head applied for (and subsequently received) permission to convert the property from a single-family dwelling into six apartments. He subsequently abandoned the permit but it appears that the property was operated as a multiple dwelling from that time. On April 25, 1968, Patrick Trani acquired Theodore Head’s interest in the property. Theodore Head moved at about that time to Pompano Beach, Florida. By 1984, 346 Marlborough was assessed as a four-to-six unit building, from 1992, it was assessed as a two-family dwelling, and from 2003, it was assessed as a three-family dwelling. On May 15, 2014, Patrick Trani transferred ownership of 346 Marlborough to himself, with life estate for his lifetime, and joint remainder interest to his spouse, Timothy A. (Chapell) Trani. Patrick Trani died in February of 2015. 346 Marlborough subsequently changed hands. It remained assessed as a three family dwelling in 2017.